I was looking at all the awesome responses to my survey today. (You have taken my survey right?!) I noticed a bit of trend. Some of you are struggling with content. Quick primer. In the context of marketing your business, content is any marketing that involves the creation and sharing of media and words in order to acquire and retain customers. The form this content takes can be pretty much anything. News, video, white papers, e-books, infographics, case studies, how-to guides, question and answer articles, photos… anything. The engine that drives your marketing efforts is content. The source of this content is your knowledge and everything happening around you. The single most important thing to remember is that you do not lack for information. There are three kinds of content. Sounds, words and pictures. Words: This is written content. Blog posts, emails, your website copy, your product labels, your business cards, your booth, your delivery car. Pretty much anything where pencil or (pixel) was put to paper (or screen). Sounds: This is spoken content and in some cases could include other sounds like music or ambient noise. How do you and your representatives speak about your products? How helpful are you/they? This also includes recorded spoken content like podcasts, voicemail recordings, radio ads etc. Pictures: Yep, this is pictures… both still and moving. Video, photography and illustrations all fall into this category. There are millions upon millions of channels for your content. Word can be placed pretty much anywhere. Real world channels like your delivery car, store or booth environment are just as important as digital channels like your website, social media accounts and blog. If you are struggling, get in the habit of collecting content all day long. Snap pictures with your phone, make a quick video… again on your smart phone. Record audio notes as things occur to you or jot them down in a notebook, save interesting web articles in Evernote or Pinterest. You need some benchmarks to bounce your content against. 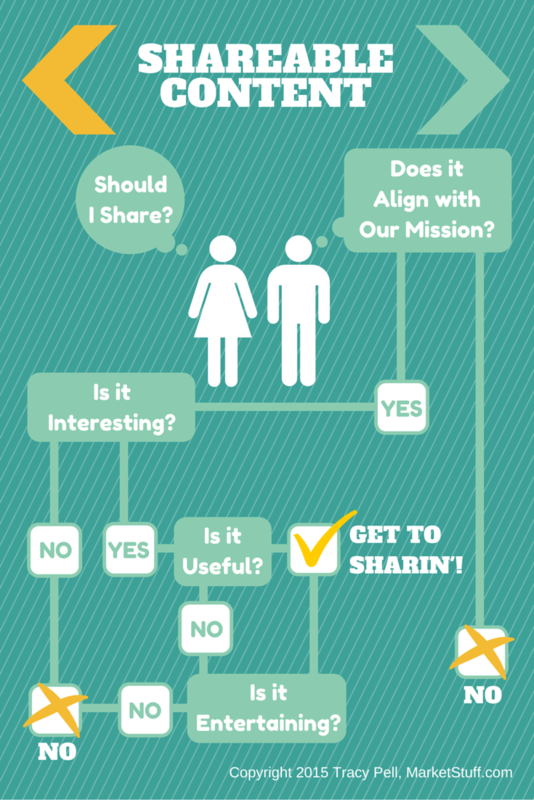 This will help you determine if it is worth sharing. Does it align with your mission? Would your customer find it interesting? If it isn’t Useful or informative is it funny? Whala! It passed muster… share it! As I mentioned before there are TONS of channels out there. YOU need to pick the ones that make sense for you and focus on them. There are TWO criteria. If neither of these are met then you can strike that channel off your list. Is there a chance a good number of your customers will see it? Will you keep it updated? Instagram might be AWESOME but if you hate taking pictures and don’t really like using you smartphone then it is not going to do much for you. SIDE NOTE: You do need to think about you level of discomfort and balance that with your need to reach your customer. Sometimes a little learning will get you past your discomfort and help you activate a channel that could pay dividends. So do some soul searching before you dismiss a channel due to your own discomfort or lack of knowledge. You don’t need to have a bunch of expensive equipment or special skills to make this happen either. In most cases a smart phone, a computer and a web connection are all you need.